To assess the content in Next Gen PET curriculum, including mechanics, magnetism and static electricity, waves, sound, light and physical science topics such as physical changes and chemical reactions. Login or Register to Download Downloads are restricted to high school and college faculty. A ball is kicked straight upward. Why does the ball go slower and slower as it moves upward? The ball's force is getting used up. The total (net) force acting on the ball is in the downward direction. There are no forces acting on the ball. The force due to the kick gets smaller as the ball moves upward. If a person is on a roller coaster, at which of the following points is the gravitational potential energy the MOST? Everything you need to know about implementing the NGPSD in your class. P. Engelhardt, S. Robinson, E. Price, S. Smith, and F. Goldberg, Developing a conceptual assessment for a modular curriculum, presented at the Physics Education Research Conference 2018, Washington, DC, 2018. The multiple-choice questions on the NGPSD were developed by identifying the learning goals for each Next Gen PET unit, collecting existing validated questions from multiple sources, and associating each question with one or more learning objectives. New questions were constructed when there were not enough existing questions for a unit. These questions were given to approximately 275 introductory physics students as a pre and posttest, the reliability and difficulty of the questions was determined, and a few questions that were too easy, or did not correlate well with the test were removed/replaced. The NGPSD was then given to students in classes taught by 17 different instructors, and results analyzed with appropriate statistical tests. The results of the NGPSD are published in one peer-reviewed paper. 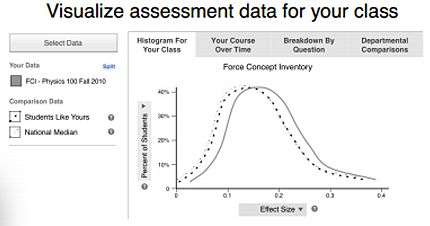 Login or register to download the answer key and an excel scoring and analysis tool for this assessment. The NGPSD is under-development, so there is only preliminary data around student results. The developers find that the normalized gain varies by unit, but averages around 12%. The latest version of the NGPSD, released in 2018, is version 2.